The Field Marshal Montgomery Pipe Band is one of the leading pipe bands in the world, and the most influential and successful pipe band from Northern Ireland ever. Led by Pipe Major Richard Parkes MBE, Pipe Sergeant Alastair Dunn and Drum Sergeant Keith Orr, the band has won every major championship title available, including 12 World Pipe Band Championships, three ‘Grand Slams’, 14 Champions of Champions titles, 25 All Ireland Championships and 606 RSPBA major championship titles. Based in Lisburn, the band is representative of Northern Ireland with membership spanning all four corners of the country. In recent years, FMM has attracted members from as far afield as Australia, New Zealand, Canada, USA, Denmark, France, Scotland, England, and of course the north and south of Ireland. The band is exceptionally proud of both its Northern Irish and international status. The Field Marshal Montgomery Pipe Band has become one of the most consistent and decorated competitive pipe bands in history. Though its philosophy has been competition based since its inception in 1945, the band also performs at concerts, festivals, radio and television appearances, and civil and social functions. Début, Live in Concert, Unplugged, RE:CHARGED and IMPACT – Live at the Glasgow Royal Concert Hall 2016. For the Field Marshal Montgomery Pipe Band, the successes of today are a steady progression from humble roots. The band was founded in 1945 in the townland of Drumalig, a few miles from Carryduff on the outskirts of Belfast. A group of farmer’s sons had decided to form a band as a leisure pursuit in the wake of World War II, and they proposed to call their formation after one of the great heroes of the war, Bernard Law Montgomery. The youths wrote Field Marshal Montgomery to ask for permission to use his name. Not only was permission granted, but their hero even sent a ten shilling note as a personal contribution to the band’s funds. In the years to follow, the band successfully worked its way through the lower grades, led by FMM’s first pipe major Billy Maxwell. Billy was President of the band right up to his sad passing in 2013 and was a huge influence on the development of FMM into the competitive force it is today. Billy was succeeded by Sandy Cuming, Ricky Newell, and eventually Richard Parkes, who took over with his brother Gordon as leading drummer in 1981. 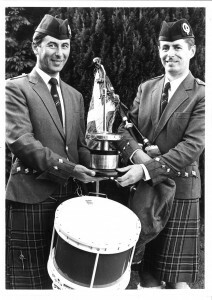 Forty-five years after its inception, the band won its first major championship in Grade 1 at the Cowal Championships in 1990. 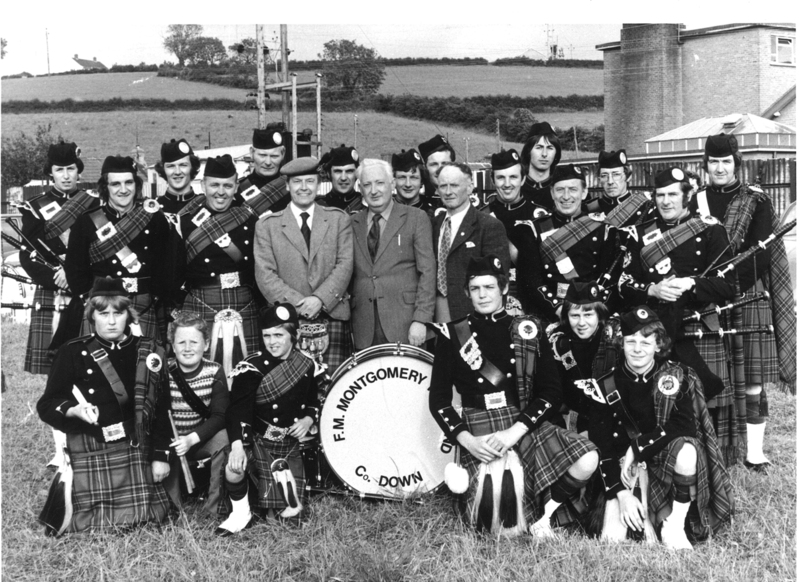 The band’s first World Championship win in 1992 catapulted Field Marshal Montgomery from the status of an up-and-coming local band in Northern Ireland to the pinnacle of the pipe band world. This first ‘Worlds’ win was followed by a second title in 1993, subsequently winning the elusive “Grand Slam” of all five major championship titles in a single season. This placed FMM as one of only a small number of bands who can claim such an achievement. Gordon Parkes stepped down as leading drummer in 1998, and was succeeded by Andrew Scullion, and in 2003 by current Drum Sergeant Keith Orr. 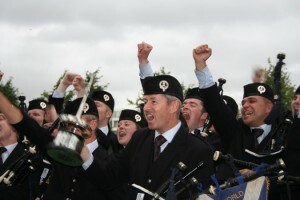 Over the years 2000-2009, the Field Marshal Montgomery Pipe Band rose to become the most dominant pipe band of the decade, securing 28 major championship wins, including four more World Championships (and five runners-up awards). This decade however was not all smooth sailing. In 2004, Pipe Major Richard Parkes suffered a stroke and the entire piping world waited to hear about the health of one of the most respected Pipe Majors in history. The band pulled together to support Richard, with Alastair Dunn stepping in to lead the band to victories at the Scottish and All Ireland Championships. In one of the pipe band world’s fairy-tale stories, Richard recovered his health and was able to lead the band to win the last three championships of the season, including FMM’s fourth World Championship title. Already in the works but unbeknownst to Richard and the band, at the conclusion of 2004, Richard was awarded an MBE for his services to pipe band music in Northern Ireland: a great honour for the man who had changed the history of pipe bands in his country. The Field Marshal Montgomery Pipe Band has often been dubbed “The Richard Parkes Success Story,” and the great respect for Richard from within his own band and from his competitors is as much a part of the band’s hallmark as is its list of prizes. In the years that followed, FMM continued its record of competition success, winning the Champions of Champions award for the most consistency in a pipe band season in both 2009 and 2010. The band secured wins at the Worlds once again in 2011 and continued the trend with wins from 2012 to 2014 and in 2016. During that period two further Grand Slams were also delivered, making FMM the only ever band to achieve such a feat more than once. 2013 was a special year with Keith Orr’s Drum Corps winning the World Drum Corps title for the first time in the band’s history and – courtesy of also winning the British and European titles – securing its second Champions of Champions Drum Corps award under Keith’s leadership. History was made with the band’s victory at the 2018 World Championships, where P/M Richard Parkes MBE became only the second pipe major in history to lead a Grade One band to 12 World Championship titles. In September 2018, long-serving Pipe Sergeant Alastair Dunn stepped down after 21 years with the band to focus on work and family. Alastair was integral to the band’s succcess, leading the way for the band’s large Scottish contingent of pipers. He was succeeded by Matt Wilson, a piper with the band since 2005, whose professional work includes leading the Dollar Academy Pipe Band to several juvenile World Championships. Field Marshal Montgomery Pipe Band is proud of its association with sponsors R. G. Hardie & Co Ltd and Premier Music International Ltd. Both provide the band with first-class products to showcase its talent, and their support is central to the band’s ongoing success. Over the past 70 years, the Field Marshal Montgomery Pipe Band has risen to the top of the pipe band world. We are extremely grateful for the support we receive wherever we play and remain as driven and motivated as ever for the future. Found the band whilst looking for some pipe music. I think I have all of your internet appearances “favourited”. Will be looking in the local record store for a CD or two. Congratulations on your success, no doubt due to a lot of hard work as well as ability.. Love Emma Barr – she enhances your marching with her skill; like a Drum Major should. I emigrated to Scotland (from Canada) in the early years of 1992, my wife and children had gone to Scotland in the Summer of 1991. I was in attendance at the ‘Worlds’ when a ‘lifelong’ mate (Blair ‘Buz’ Brown) told me that I should go to listen to FMM’s Medley! Why I said, he said because they are playing your ‘MAXWELL’s Bonnet’!! I had written this so many years ago for an American Pipe Band Drummer (Buddy Maxwell) and after several years of nobody ‘taking it on’ after it was published, I was so surprised to hear that the ‘brilliant’ FMM’ were using it in their Medley!! At that point, it was used as the finishing for their medley! Reduced to tears as none had ever ‘picked-up’ on this Hornpipe! While at the ‘Worlds’ in 2015 my son (Calum MacCRIMMON – Breabach.com) and I were having a chat and I asked him what he thought about ‘Maxwells Bonnet’ and his reply was that it was a piece that had never utilised the ‘clean’ playing from D to A in a 2 beat rhythm! I can’t express the sheer enjoyment that this absolutely wonderful band gives me. same way, has this gift. Greetings and Best Wishes For the Future, John Fenner.